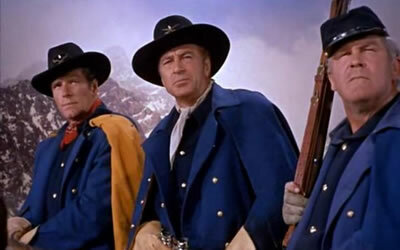 SPRINGFIELD RIFLE is but one of forty westerns Gary Cooper graced between 1925 and 1959. Alas, it’s not one of the better ones. Rather, it’s just a pokey, confusing 1952 Civil War espionage yawn about a Union officer infiltrating a Reb horse-theft ring out in Colorado. Stifle your excitement. I was pretty undemanding as a kid watching this, and it bored me then. Reviews were phooey, but it did generate $4,900,000 to put in at #36 for the year. 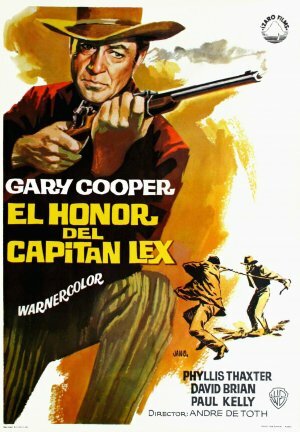 Cooper goes through the motions with little energy, but could take solace from the same year’s hit and an Oscar for High Noon. 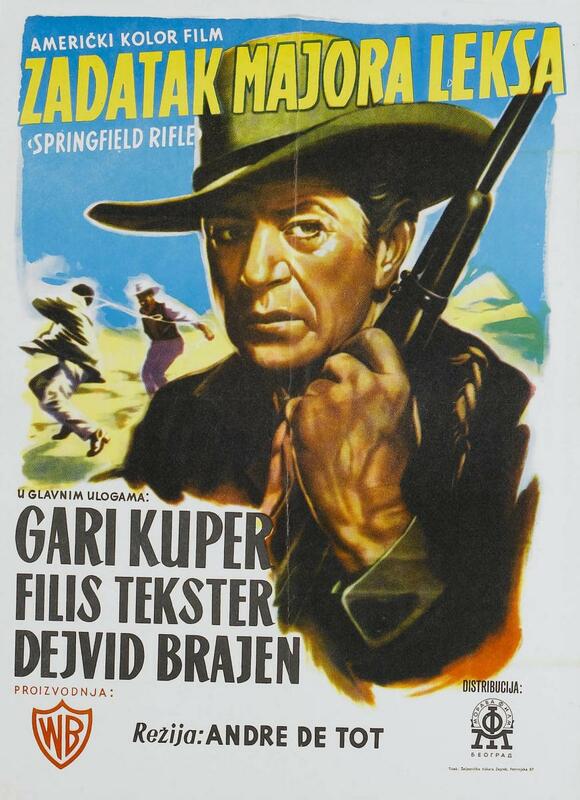 As this turkey’s tagline had it, “The right man…for the right gun.” It has some standard Warner Brothers action, and looks decent, shot in the mountain scenery near Lone Pine, California. Max Steiner music helps when it can. Glenn Erickson, master reviewer at DVD Savant, posits this as a ‘Cold War western’, using the genre as a veiled vehicle to push acceptance of government spying, let alone extolling lethal hardware. Nefarious softening up the kids for polishing off the Godless ? Perhaps, since the Korean War and McCarthy were raging. Same year witnessed hysterical agitprop via The Atomic City, Big Jim McClain, My Son John, Invasion USA, Red Planet Mars (really going the extra mile). That was just the Home Front, as there were Commie-combat movies mixed in, like Retreat Hell!, One Minute To Zero, Battle Zone and Flat Top. Of those nine there’s one decent entry, Retreat Hell! Yikes–there was another ‘salute to a gun’ movie, too, Carbine Williams, with James Stewart inventing new automatic rifle technology, while in prison—for murder. None of this was banging around in my impressionable noggin when I patiently sat through this as a kid, watching rainy Saturday afternoons go by in the vanished innocence of early 60’s Bellevue*. 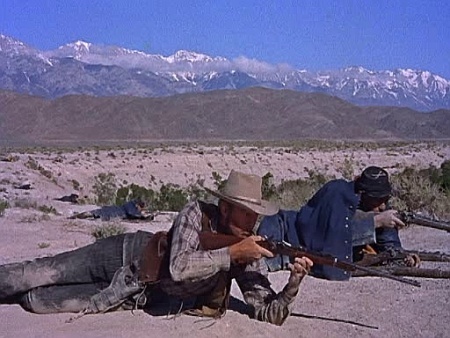 Leaving conspiracy out of it, if you want a good western revolving around a rifle, aim at Winchester ’73. Directed by Andre De Toth, snoring by at 93 minutes, with dependable but undemanding work from Phyllis Thaxter, David Brian (as bad guy ‘Austin McCool’), Paul Kelly, Philip Carey, Lon Chaney Jr., James Millican, Guinn Williams, Alan Hale Jr., Martin Milner, Fess Parker. *The town, not the hospital.